Georgia Futures directory gives upcoming college students information about scholarships, financial aid, tuition cost, housing, as well as in-state and out-of-state college differences to consider. This is a directory that all students should view and explore when making the decision about whether or not to attend college and which college to attend. 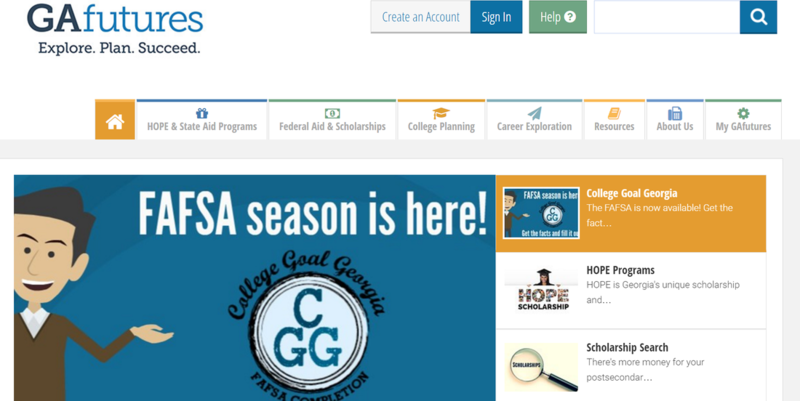 The homepage shares stories of reward recipients, news from the Georgia Student Finance Commission and trending informational articles related to going to college. A few of the trending articles include REACH Signing Day, 2016-2017 Award Amounts and Move on When Ready. I learned that REACH Georgia is a needs based mentoring and scholarship program that provides promising students the support to further their education in and beyond high school. Move on When Ready is for students at eligible high schools to complete college level coursework for credit towards both high school and college. As a teacher, this is a useful website to find out about current scholarships, programs and trending information that would positively affect your students. You can inform your students about opportunities that they may not be aware of through this website. We want the best for our students and this website helps us to prepare them for their future and encourage their dreams. 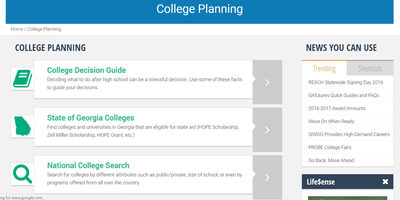 The College Planning tab has a College Decision Guide. The Decision Guide has a chart showing education level and how that directly relates to income. Graduation requirements are also listed. There is a College Planning Timeline that starts with Middle School and goes all the way until the summer after senior year with checklists and links to specific websites with information that students need to be exposed to before going off to college. 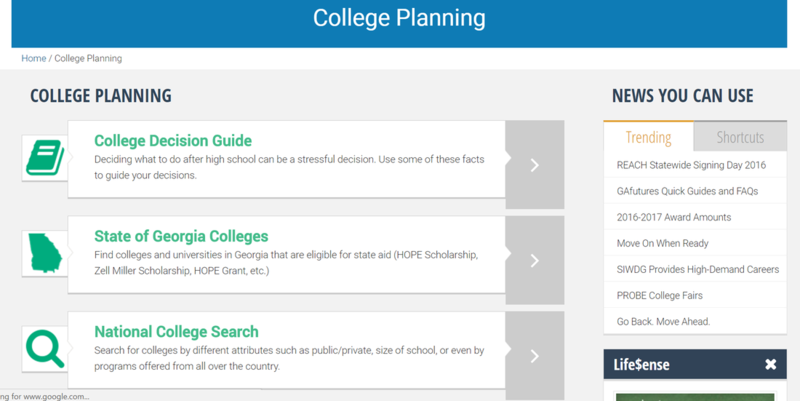 The top of the Decision Guide has tabs with colleges in Georgia and a national college search. This website also offers a career exploration tab, where students can take an assessment to learn about themselves and which careers will use their particular skills and interests. Students will enjoy taking this assessment and learning about themselves. There is a Career Exploration section where students can learn about the career they are interested in. I appreciate that the website also includes information for skilled trade and military jobs. Some students will not go to college and it’s great this website has information about education past high school for those students. This is a terrific website for students planning on attending college. I am sure parents will also find this website insightful. College requirements, tuition and expectations change yearly. This website is a great tool for teachers, parents, and students to keep them informed of changes and give them direction on how to move forward when planning for college and future careers. The website explains that their mission is to promote and increase access to education beyond high school. Grades: 8th and up. Subject(s): Education after High School. Overall rating: 9.